No matter what your IT role, a project management certification can add depth, breadth and value to your role. Here are the top project management certifications, their requirements and cost. Behind every successful IT project, you'll find a highly skilled project manager. From hardware and software upgrades to ongoing security patches, to application development and the rollout of software itself, project managers keep your teams on task and productive. Almost any IT pro can benefit from adding a project management certification to their list of IT credentials; showing you have the know-how to plan, schedule, budget, execute, deliver and then report on IT initiatives. Here, CIO.com outlines the most popular project management certifications that will add value and help you hone your skills this year. The gold standard in project management certifications, the Project Management Professional certification is a rigorous test that covers absolutely everything you need to prove your knowledge and skill in managing the "triple constraints": time, cost and scope. The Project Management Institute (PMI) is this credential's parent organization, and works continuously with businesses and academia to ensure relevance for the certification. Be sure to check out our guide: How to ace the Project Management Professional exam. Price: Computer based exams are $405 for PMI members; $555 for non-members. Paper-based exams are $250 for PMI members; $400 for non-members. Requirements: Four-year secondary degree plus three years of project management experience, 4,500 hours leading and directing projects, and 35 hours project management education OR a high-school diploma, five years of project management experience, 7,500 hours leading and directing projects, and 35 hours of project management education. The Certified Associate in Project Management is the precursor to the PMP certification and is also administered by the PMI. For professionals without a college degree, or with only rudimentary project management experience or those who want to achieve their PMP certification in steps rather than all at once, the CAPM is a stepping-stone to the more rigorous PMP. For more information, see "CAPM certification guide: Certified Associate in Project Management exam explained." Requirements: High-school diploma, associates degree or equivalent and at least 1,500 hours of project management experience OR 23 hours of project management education. The use of agile methodologies has become the standard in IT organizations, so it's not surprising that IT practitioners uniquely qualified to manage projects in agile environments are in high demand. While there are different Scrum master certifications available, the Certified ScrumMaster (CSM) from Scrum Alliance is a great jumping-off point for project managers getting started as Scrum practitioners. The Scrum Alliance, the parent organization for this credential, is a nonprofit organization that encourages the adoption of scrum and agile practices, promotes user groups and learning events, and provides resources for professional development. The organization boasts more than 450,000 certified practitioners worldwide. For more information, see "CSM certification guide: Certified ScrumMaster exam explained." Requirements: General familiarity with scrum; completion of a two-day Certified ScrumMaster training course. This entry-level certification is roughly on par with PMI's CAPM credential, though the requirements are less stringent. CompTIA's Project+ solicits feedback from the entire computing industry, government representatives, research institutions, academia and independent experts to design the certification. Requirements: One year of experience managing, directing or participating in small- to medium-sized projects is recommended. Projects in Controlled Environments (PRINCE2) is most well-known overseas, especially in the U.K. and its government entities. The PRINCE2 certifications are delivered by the ILX Group and focus on directing, managing and delivering projects across all phases, pre-project, initiation, delivery and final delivery. There are two primary qualifications, PRINCE2 Foundation and PRINCE2 Practitioner. The Foundation certification is an entry-level credential that tests basic project management terminology and methodology, while the Practitioner certification tests advanced project managers who have already achieved PRINCE2 Foundation. Requirements: PRINCE2 Foundation requires a PRINCE2 Foundation course; PRINCE2 Practitioner requires one of the following: PRINCE2 Foundation; Project Management Professional (PMP); Certified Associate in Project Management (CAPM); or an IPMA certification. The EC-Council was formed after the Sept. 11, 2001, terrorist attacks to address issues of cyberterrorism and the information security of nations at large. The EC-Council's Certified Project Management Practitioner course is for project managers who want to benchmark their skills through hands-on experience and across various management techniques and tools necessary to successfully manage complex projects efficiently. The objective of the CPMP course is to add value to management professionals by developing managerial, leadership and technical skills required to make any project, small or complex, a success. Requirements: No prerequisites, but it is recommended that candidates attend a three-day preparation course. The Global Association for Quality Management (GAQM), which administers the Associate in Project Management (APM) — as well as a Professional in Project Management and a Certified Project Director certification — is a global, not-for-profit certification body that offers credentials across a variety of IT specialties. The GAQM's project management certifications are focused on a broad knowledge base and emphasize effective resource allocation, clear direction, adaptability to change, effective communication and assurance of quality deliverables at minimal risk. The APM program is designed for the entry-level project manager, or for those who want to start a career in the field. Requirements: GAQM body of knowledge study and e-course; no formal education or experience requirements. The American Academy of Project Management (AAPM) has modeled the Master Project Manager (MPM) after the "professional licensure" model that many professions like pilots, engineers, doctors and lawyers follow. The AAPM focuses on professional project managers, but also includes those pros with business and technical management responsibilities. Price: $300 for application, review, processing, review, initiation and certification. Requirements: Three years of project management experience and training. Waivers are available for professionals holding a master's degree, with other qualified training and experience, the military or project management instructors. The Professional in Project Management (PPM) is a mid-tier project management credential from the GAQM. The GAQM's project management certifications are focused on a broad knowledge base and emphasize effective resource allocation, clear direction, adaptability to change, effective communication and assurance of quality deliverables at minimal risk. The PPM is targeted towards intermediate to experienced project managers who are involved in risk and crisis management, and who are involved in the day-to-day management of projects. Requirements: GAQM body of knowledge study and e-course; no formal education or experience requirements, but candidates should have at least some project management experience in order to pass the exam. The EC-Council’s Project Management in IT Security (PMITS) explores the complexities of managing an IT security project. 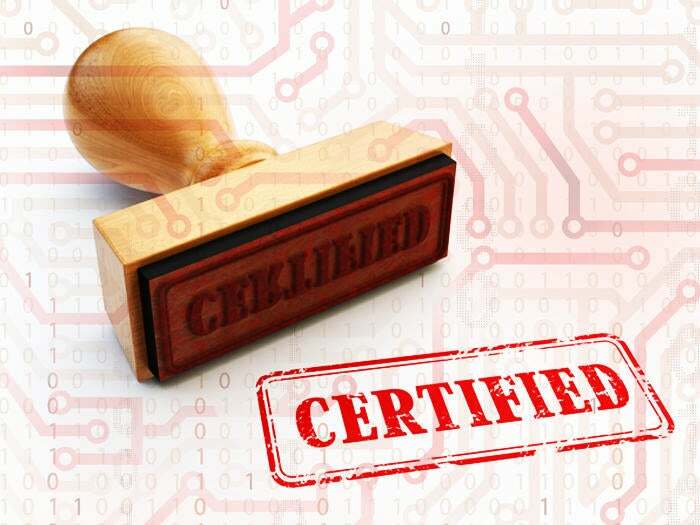 The certification helps candidates reinforce their existing project management skills while tailoring them to the unique requirements of implementing and managing IT security within their organizations. Requirements: At least two years of experience in information security and an educational background that shows a focus on security (bachelor's degree or higher preferred). Candidates may also opt to attend an EC-council training program before attempting an exam. The GAQM's Certified Project Director certification is the credentialing body's highest-level project management certification. This designation is designed for experienced project managers who are involved in directing multiple, complex projects and programs. The program focuses on managing, budgeting and determining scope for multiple projects, multiple project teams, and assessing and mitigating interdependent risks to deliver projects successfully. The CDP program is only for those who have significant project management experience. Requirements: GAQM body of knowledge study and e-course; candidates must be familiar with principles and methodologies of project management and pass the PPM or equivalent exam. The International Association of Project Managers (IAPM) is a global professional association and certification body focused on the project management profession. The IAPM’s purpose is to promote research, development and practical applications of project management, develop standards and guidelines for both beginner and advanced project management training, and review and approve project management competencies within the profession. There are four levels of certification within the IAPM, split into two disciplines, traditional project management and agile project management: Certified Junior Project Manager and Certified Junior Agile Project Manager; Certified Project Manager and Certified Agile Project Manager; Certified Senior Project Manager and Certified Senior Agile Project Manager; and Certified International Project Manager. IAPM’s Certified Project Manager certification is for candidates with a foundational knowledge of project management, including the basics of planning, organization and implementation of various projects. The exam covers both the hard and soft aspects of project management. Price: The certification and examination fee depends on a candidate’s nationality; pricing is gauged based on country-of-origin’s GDP to ensure that any candidate can afford the training and testing. In the U.S., the certification and exam cost is $650, with a 20 percent discount for students, job seekers and active aid organization personnel, according to the IAMP. Requirements: There are no prerequisites, but IAPM offers workshops through global training partners, or recommended literature for self-study. Once a candidate has completed the workshop or feels adequately prepared, they can take a self-test to benchmark their knowledge. Candidates must achieve a 65 percent on the exam to pass. Many colleges and universities offer project management certificates through their existing business, management or professional education programs. Schools such as Villanova, University of New Haven, Stanford University and others (check your local college or university's course offerings) have excellent project management programs and certificates; some for-credit, others not-for-credit. There also are IT vendor-specific project management certifications available, such as the Microsoft Project Certification. Requirements and price vary based on institution.